I’m a lightweight, and proud of it. In a game dominated by those throwing max weight drivers in search of the biggest distance – and, in many cases, ego – possible, I am man enough to admit that I am perfectly content throwing my Latitude 64 Opto Diamond for most drives. Standing out on the fairway with its hot pink hue and weighing in at a whopping 154 grams, it is now a staple of my game. In fact, I am building all of my drivers around this weight class for the foreseeable future, and I am quite pleased with the results so far. It hasn’t always been like this, though. In fact, during my two-plus years of disc golfing, I have taken some bad advice, ignored some good, and felt some pain to finally get to this point. Let’s start with the bad advice. When I first started playing, I headed out to league night at my local course – not to play, but to learn. The president of the local club was nice enough to show me around and take a look in my bag, which at the time consisted of an Innova DX Valkyrie and the Leopard/Shark/Aviar trifecta found in the company’s starter pack sold in big box stores. Disc golf is a fringe sport. I make no bones about that, and I understand it isn’t for everyone. That being said, I am always looking to get more people to try out the game. I figure that, since it is relatively inexpensive and I have had such a good time playing, others might get hooked as easily. So when I was able to swindle seven of my friends — most of whom had never played — into driving an hour and 20 minutes from home to play a course, I thought I had hit the jackpot. Thinking back on it, I suppose the beer probably helped, too. You see, the 80-minute trek wasn’t just for any old course. It landed us at Anderson Valley Brewing Company in Boonville, Calif. Home to its own valley language and delicious craft brews like Hop Ottin’ IPA and Barney Flats Oatmeal Stout, the facility also boasts an 18-hole disc golf course. In short, this place is my own personal Mecca. The fact that I suckered my buddies into coming, though, was a total bonus. It all started with some innocent emails. My friend Shane Andersen was coming back into the states for some R&R after working in the Middle East for a few months, and he was hoping everyone might be able to get together in our hometown in Northern California. Since I had been wanting an excuse to head to Anderson Valley, I casually threw out the idea of heading up for the day, playing a round of golf, and imbibing a bit — emphasis on imbibing. Expecting to be roundly rejected, I didn’t get my hopes up too high, knowing that I could always go shoot a round at the local course with my dad and still do plenty of drinking of craft beers without the big trip. When describing my skill level to fellow disc golfers, I often refer to myself as a “recreational enthusiast.” I love the game, and play as often as I can, but I am still not a great player. Naturally, then, I am always looking for ways to strengthen my game. Whether it is some way to add more distance to my drives, or a putting routine to improve my accuracy, I will take any pointers I can get. Sometimes this helps, and other times it leads me to change what I am comfortable with, which yields inconsistency. 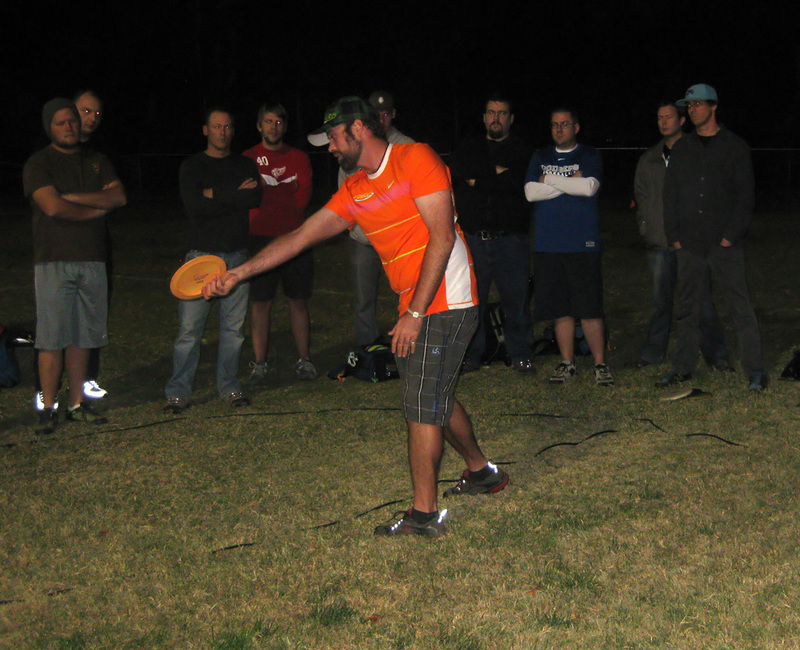 So when I heard that my local pro shop, Kinetic Disc Golf, was bringing an instructional clinic to Kit Carson Park in Escondido, Calif., featuring top players Dave Feldberg, Nikko Locastro, and Philo Brathwaite, I jumped at the opportunity to attend. It isn’t every day that three 1000-rated players roll through town, so I figured I should take advantage. A brain left drowning in new ideas and techniques, simply trying to wade through all of the knowledge and seize on what would help me the most. Arguably one of the most successful disc golf ventures of the last year is Innova’s Blizzard Champion plastic, in which air is injected into discs during the molding process to make them lighter. Used to bring down the weights of warp speed drivers like the Boss and Katana — as well as a host of others — it was only a matter of time before Innova extended the Blizzard trend to Star, their top-of-the-line, opaque plastic. 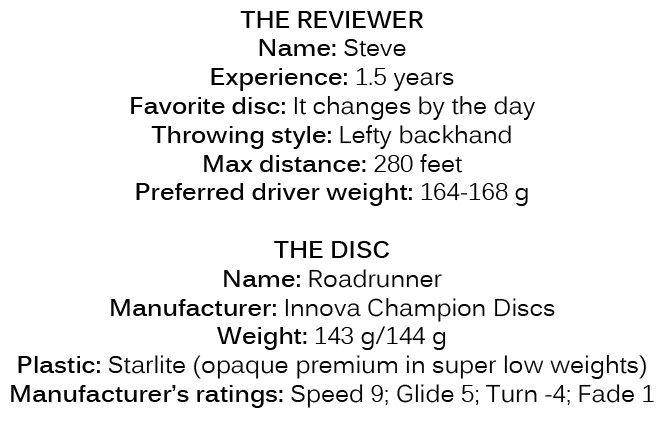 But when Innova announced that its first foray into this field would be used on the Starlite Roadrunner, I was counted as one of the skeptics. Already a massively understable disc, the Roadrunner is one of my favorites. You can go full bore on it for easy distance and big turnovers, or use it for precise hyzer-flip flights through wooded courses. It is a pretty underrated disc, in my opinion. However, given its penchant to be a bit flippy in regular weights, the thought of it moving down into 140-gram territory seemed unnecessary. Innova’s previous lightweight discs were all in the stable-to-overstable category, and making them weigh less served to lower the cruising speed they needed to reach their optimal flight. But since the Roadrunner already did not require much power to fly correctly, making it in this new Starlite plastic seemed like a runaway train to roller city. But when I went out to play with some friends one day, another guy had picked one up and let me give it a toss. I immediately went from a skeptic to a devout convert. The ease with which the disc flew, and the lack of effort needed to make it do so, was quite enticing. As a result, I picked up a couple of my own to see if they could make the bag and help me reach that ever-elusive noodle-arm barrier — a 300-foot drive. This is the second of a two-part series about DGCourseReview.com. The first part ran last Friday. 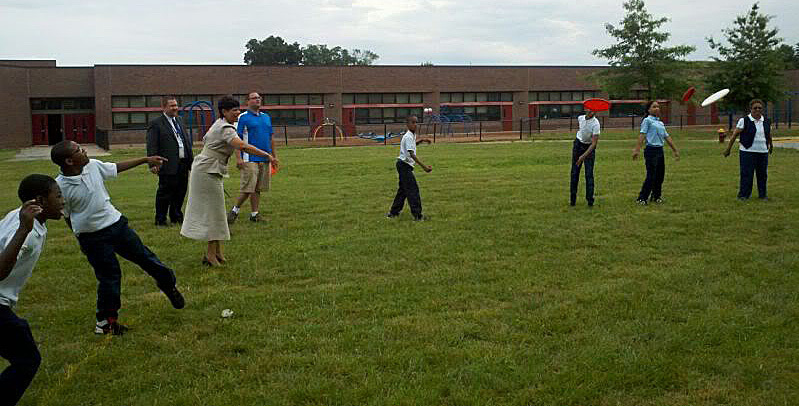 Relative to other sports, disc golf is still in its infancy. It does not have a long history, nor does it boast a mainstream following. For every person who plays the sport, there are likely five more who have never heard of it. For players who become quickly addicted to the game, then, there is a void. While they would like to spend all day and night talking about all things disc-related, there are likely few other friends or family members who have any shared interest. It is this lack of local conversation that leads many players to the discussion forums at DGCourseReview.com (DGCR). With nearly 35,000 registered users, they are bound to find someone with whom they can click. Site founder Tim Gostovic has created multiple forums for discussion within DGCR. A byproduct of his efforts, though, has been multiple strong relationships founded and maintained through the site. Members can unite by posting threads in the site’s dedicated DGCR Meets subforum, or through simply finding someone in their neck of the woods and sending them a private message. Ryan Glasshagel of New Glarus, Wisconsin, has taken the latter approach and played with about ten fellow DGCR members.